However, looking forward to some more sailable weather, and actually feeling like its summer! Calendar: Lots of good stuff, including a harbour blast again this summer after a couple of years without. There will also be another womans clinic this summer (gybing, tacking, whatever you want to learn), date yet to be decided  if interested call me on 380 9528. Membership: PLEASE pay your subs if you havent already! The slalom event on 11 Dec will be free for members only and $10 for non-members. Subs can be paid on the day. Kio Bay: The lack of changing facilities is apparently resulting is certain sailors having to chase their underwear down the road. Although our chances of improving (?) that are remote, we are going to ask (again) whether the council might be amenable to at least getting the beach back to the state it was in a few years ago. The first relay of the season was held at Eastbourne in early November. 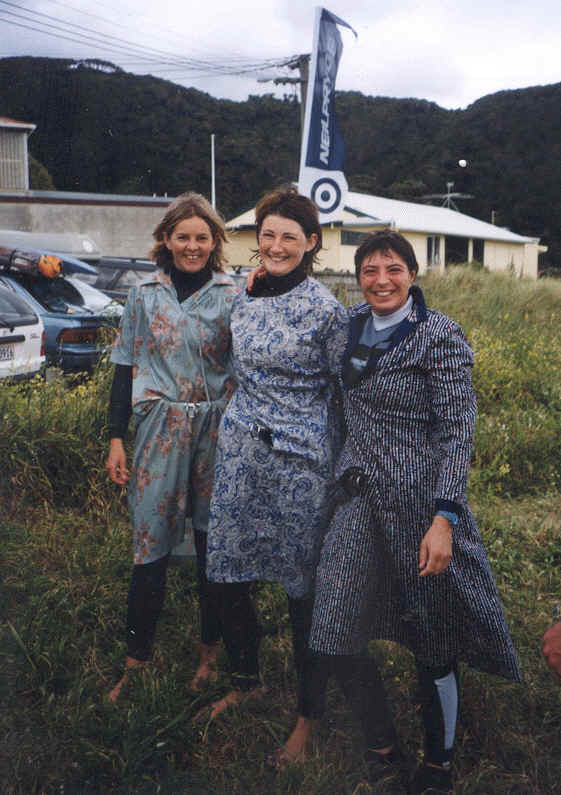 Lydia, Ruth and Bronwyn sailed the first leg out to Ward Island (and all gybed - something of a record), and returned to be helped out of their frocks. The next three donned the dresses to shrieks of laughter, including the expected quotes such as "but I only know how to take these off". The A team in stunning blue paisley won the race, but there wasnt much left of the dress after Roger and 6 other burly blokes had worn it. It was a really fun day, mostly good sailing and another excellent BBQ. Thanks to James for organising the day, and having the balls to buy the dresses (we can confirm that they were purchased specifically for this event), and to others that helped out on the day. There was several suggestions of possible captions, few of which were printable.. The second Boardriders "King of the Ditch", in association with North Sails, got off to a flying start as Saturday dawned with gusty 20-30 knot northwesterlies blowing through Evans Bay. A quick change of venue to Kio Bay for better wind angles delayed the start until 12pm, allowing the 20 competitors to get some last minute Vulcan practice. The consistent wind allowed a full double elimination round to be run with some of the hot favorites faltering in the strong conditions. Eventual winner, Lawrence Young, fought his way through some tough heats, beating last years King Gary McCorry on the way to the semi-finals. A new scoring system that rated only completed moves saw many sailors having to change their strategies in order to advance. After an exhaustive double elimination in which every sailor got to sail at least twice, the first semi final featured Clayton Dougan and Lawrence Young fighting it out in the now solid 30+ knot winds, with Lawrence narrowly advancing to the final. The second semi pitted Troy Purcell looping like a man possessed against Swiss international sailor Mark Hollenstein, with Mark advancing into the final. At 4.30 the extended 10 minute final got underway with two very tired sailors hitting the water. Forward loops and 360s were the order of the day with Lawrence Young being crowned King of the Ditch for 1999. Sue Johnston sailed hard against the boys to take out the Queen of the Ditch. Heres hoping there is more opposition in this section next year. We definitely dont want Nick Bowes carrying out his threat of sailing out in a dress (ouch) to contest this division. Prize giving at the Greta Point saw everyone enjoying the warmth and making plans for the next years King. Thanks to Noel and Boardriders for putting on the event again this year. 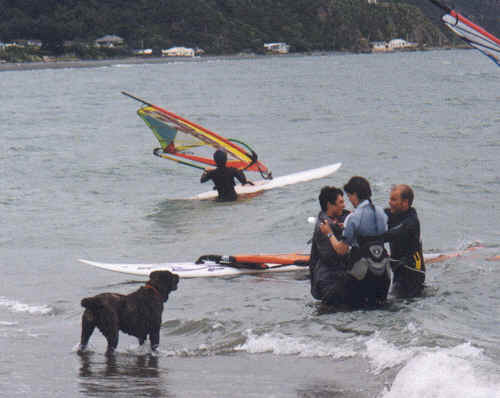 A new windsurfing school has opened in Wellington, with lessons to be held at Seatoun. Contact Boardriders (499 3655) or James Barber (021 388 130) for more information or bookings. For the Wild Winds school at Pauatahanui, contact Wild Winds (384 1010). Racing for all levels. We will have the rescue boat out. Members free, non-members $10. Liquid prizes to be awarded. Gourmet BBQ! Reserve Day Sunday 19th December. Location: Scorching Bay if S, Seatoun if N.
Start time: Registration and skippers meeting 11.30, first race 12pm. More details closer to the time, but note that this is to be a FUN event with trophies for the winners, but spot prizes only (no money). Contact Bronwyn to place an ad. Wanted: beginner's board & rig, and one or more keen beginners to go sailing with. , ph John Scott, 385 6261 (a/h). Wave Weapons wave board & Styrotech Slalom Board (hardly used), NP 4.0 wave sail (5 yr old, v. good cond), NP 5.5 race/slalom sail (7 yr old, v. good cond), Gaastra wave/slalom sails 4.4 and 5.0 (old but ok cond); 2 piece mast and 1 piece masts, several rope booms. Any offers considered. Phone Nick 479-3589 (hm) or e-mail: nick.hunn@nz.pwcglobal.com.